Food Mycology Reference from C.H.I.P.S. There are various species of fungi which like to grow on food, thereby releasing toxins which might bear a health risk for the consumer. 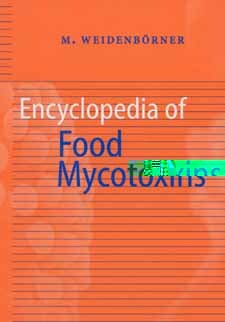 Encyclopedia of Food Mycotoxins lists all foods which have been reported to be contaminated with mycotoxins. All relevant toxin producing fungi, their natural occurence, the possible mycotoxicosis, further the biochemical and physiological effects of mycotoxins, their chemical data and toxicity are treated comprehensively. For each mycotoxin, reference is given to the food at risk. Encyclopedia of Food Mycotoxins is an excellent resource for all professionals in the food industry, agriculture, control agencies and everybody involved in food processing, scientists and students in biotechnolgy, food chemistry and microbiology.